Hengest, Fran and family have not only become trusted comrades to me over the last 10 years or so that I have been in the Rite, but close friends that I have grown to love. So After seeing on the OR Members Forum a few months before that Hengest and Fran had decided to “renew” the wedding vows that they had sworn twenty years previously by becoming handfasted, I made sure that I would be there and swapped shifts with a colleague at work that owed me a favour. So it was that on Friday the 18th of July, I set off at around 1300hrs from my small Cheshire town and drove the 200 plus miles to stay in South East London, by invitation, at the home of the young Lovers themselves! The journey is usually a four hour one, but travelling through Manchester, Birmingham and London’s notorious M25 Motorway can be difficult with delays of hours, but I managed to get there by 1900hrs and was greeted by cold beer, pizza, Saxon the dog and warm and familiar, friendly faces. Very welcoming indeed! After catching up and chatting, I gave Fran and Hengest some gifts for the occasion, some flowers and a gift card and a large, chunky Thor’s Hammer. Much to my delight Hengest decided to use the Hammer (see pictures below) as part of the blessing and threaded the handfasting cord through it. I think it looked awesome and I’m sure you’ll all agree. To be handfasted with your wife of twenty years at the White Horse Stone is the stuff of dreams for a bachelor like me, particularly as I am a proud Englishman and the White Horse stone is said to be the birthplace of the English nation! So to be asked a week before the ceremony to say a “few” words in tribute to both Hengest and Fran was a pure honour that I will never forget. They could have picked from a long list of esteemed people and for them to choose me made me so proud. I didn’t want to let them down! I was picked up on the day of the handfasting by Hengest’s good Friend Simon AOR and we travelled down to the meeting place which was the Lower Bell pub close to the White Horse Stone. It was a hot and humid day and I was pleased to see close to forty people and many familiar faces such as Asrad, Tyrsson, Blutgeist and Harry. It was also noteworthy that Hengest’s boss, Angus and his wife and young family had come along to witness the blessing, which I though was a nice touch. We made our way up the path through a leafy glade which was named “Einheriar Way” by the Odinic Rite back in the 1980s, to the small clearing in the tree line that opens up to the broad expanse that is now farmers’ fields, but where ancient Britons and Englishman died forging our lands. There, at the opening stands a large stone, insignificant to most these days; not a Grand temple, nor a towering imposing building, but when I saw it for the first time as an Odinist, it had an understated grandeur that made my soul stir. 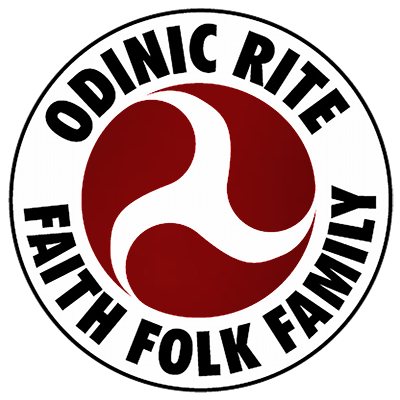 As we assembled at this Holy site, the fire was prepared and Asrad briefly explained, for the benefit of those who were not Odinists, the importance of such an undertaking and loosely what would happen at the blessing. In his usual manner it was light-hearted and eased the nerves of the first timers. Then to the Serious Business! The Holy Ve was made by Asrad, Tyrsson and Simon, the site warded and protected after which the rune gealdor was called by Hengest and repeated by all. At Asrad’s words “we kindle the fire of cleansing and creation…” Simon lit the fire and the handfasting proper began. I have to say, and I know that all agreed, that Fran looked really beautiful next to the White Horse Stone with her bouquet of Flowers and despite the forecast of thunder, lighting and heavy storms, the Sun shone and kept her hair from going frizzy! In the welcome cool shade of the tree cover the handfasting was conducted beautifully by Asrad. Hakon read a passage from the book of Blotar and then it was my turn to say my piece. I am normally good speaking in public, but such were my nerves that I admit I had to write my “speech” down. There were some Dear Friends that couldn’t make it to the handfasting who I know Hengest and Fran have a great affection for and so I’d sent some messages out via social media and the OR forum asking for those people to send me a few sentences in tribute so that I could include them as part of my speech. I should have known better, a few sentences was not enough and I was inundated with lengthy messages of tribute and fittingly so. I couldn’t read them all out, but included passages from Heimgest and Eowyn, Asrekyr, Hyndla and family, Hariulf and family and Paolo from Comunita Odinista. But the best was still to come; I had asked Hengest and Fran’s children, Hakon, Odin and Taran, to write something and tears flowed as I read those tributes out to their mum and dad. Those young men are fine individuals and a credit to their parents. After the ceremony, we advanced on the fine historic town of Rochester, where we had a meal at a local pub and a few beers to celebrate the occasion. It was nice to catch up with comrades and friends at the social gathering afterwards, but all too soon we went our separate ways and as the folk dispersed we made our way back to Hengest and Fran’s family home, where Hengest and I sat in his garden and Fran brought us beer and food. Sorry to spoil the Honeymoon! On a serious note, I wouldn’t have been anywhere else in the world, it was a most uplifting experience and I for one wouldn’t have missed it for the world. On the Sunday, Hengest and Fran took me to see the ancient Medway Megalithic sites which include the early neolithic Coldrum Long Barrow which is over 3000 years old, where we sat in the Sun and meditated for a while, then chatted about future plans before visiting Kit’s Coty and the Countless Stones. It was a lovely day and I was reluctant to travel back to Hengest’s home as I knew the weekend was over and soon I had to say my farewells and drive back home. I would like to take this opportunity to thank Hengest, Fran, Taran, Odin, Hakon and Saxon for making me feel like a part of their family this weekend, they couldn’t do enough for me and like I said I am honoured to have been a part of this very special occasion. Hail to Hengest and Fran!